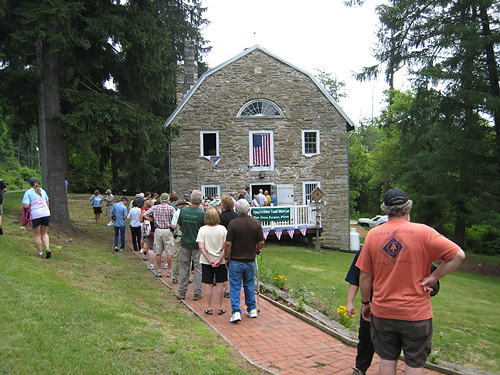 Mission: The Appalachian Trail Museum Society serves the Appalachian Trail community by telling the stories of the founding, construction, preservation, maintenance, protection, and enjoyment of the Trail since its creation. The Museum will collect, preserve, and interpret materials relevant to these subjects in an effort to portray not only the history of the Trail, but also the essence of the physical, intellectual, emotional, and spiritual human experience of the Appalachian environment and the culture of hiking. Our mission statement is reflected in the Museum that is located in Pennsylvania's Pine Grove Furnace State Park, close to the midpoint of the Appalachian Trail, the Museum is halfway between Maine and Georgia. Appropriately, the Museum is housed in a building that is itself a historical artifact, a structure built more than two hundred years ago as a grist mill. It stands across the road from the Pine Grove General Store, a site famed in hiker lore. It is here that thru-hikers traditionally stop to celebrate reaching the midpoint by eating -- or attempting to eat -- a half gallon of ice cream in one sitting. Vision: The Appalachian Trail Museum is an active, positive advocate for the preservation and enjoyment of the Appalachian Trail. Through the presentation of museum exhibits, programs, audio-visual presentations, and publications, the staff and volunteers tell the exciting stories of the human experience of the Appalachian Trail since its founding in 1921. The museum actively collects artifacts and archival material related to these stories, cares for them in a professional manner, and provides access to researchers seeking information about the trail. Trustees, staff, and volunteers seek to share their knowledge, but also their excitement and love for the trail, their dedication to its preservation and maintenance, and their appreciation for the culture of hiking and the Appalachian Mountains environment. 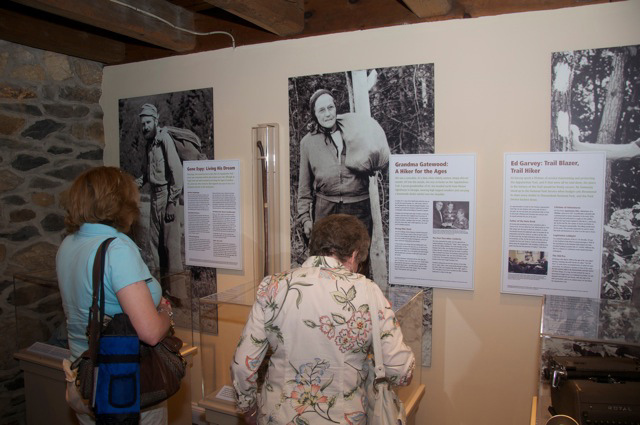 Currently, the museum has exhibits devoted to early founders of the trail - Benton MacKaye and Myron Avery, as well as some of the early Pioneer thru-hikers including Earl Shaffer, Grandma Gatewood, Gene Espy, and Ed Garvey. Another one of the highlights is the last remaining shelter built by Earl Shaffer that has been painstakingly dismantled and then reassembled inside the museum. A computer station has access to a database of over 10,000 pictures of thru-hikers as they passed through Harper's Ferry and stopped at the Appalachian Trail Conservancy to check in, or just to say "Hi". We are a 501(c)(3) non-profit that depends on contributions to support our mission. JOIN the Museum Society or make a contribution.